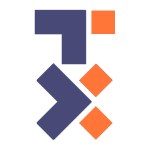 Ever get a little motion sick from an illusion graphic designed to look like it's moving? 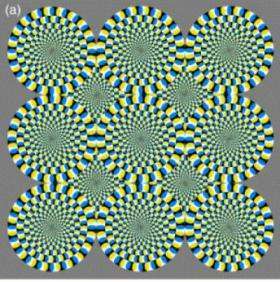 A new study suggests that these illusions do more than trick the eye; they may also convince the brain that the graphic is actually moving. Researchers in Japan, led by Akiyoshi Kitaoka of Kyoto's Ritsumeikan University, monitored brain activity as participants viewed the Rotating Snakes illusion, where concentric circles appear to rotate continuously (see below). The resulting article, Functional brain imaging of the Rotating Snakes illusion by fMRI, was recently published in the Association of Research in Vision and Ophthalmology's Journal of Vision as part of a collection of papers on neuroimaging in vision science. Prior to the study, scientists believed illusions that simulated movement involved higher-level brain activity — the imagination. But this study found the illusion sparked brain activity generated by a bottom-up process in the visual cortex. "This is the part of the brain that processes real physical movement," explained research team member Ichiro Kuriki, PhD (associate professor, Tohoku University). "The illusory motion percept is not just the observer's imagination." The researchers compared levels of eye movements as participants watched the Rotating Snakes illusion. When participants moved their eyes while watching the illusion, the study reported higher activity in the motion-perception area of the brain. Kuriki said the study has ramifications for makers of instrument panels for vehicles, aircraft and other forms of transportation. "Our findings could be important to the designers of such visual displays, as well as creators of multimedia content online or for film and television," he said.